Tell us how your day at Strathallan went! I completed a jump for my 60th birthday, just wanted to do something different to match the occasion! It was fantastic, the freefall was superb. I can't thank all the staff for all the encouragement they gave me as with the weather not being great it was 3rd time lucky before I could jump. Special thanks to John who was my tandem buddy. Top marks, 5 out of 5 for being so professional and in making this a great memory. The whole day and experience was brilliant from start to finish. The staff were amazing and can’t thank them enough. Was funny that I was strapped to Johnny for my jump who I found out lived round the corner from me ! We were a party of 11 and some of us had our kids with us. On the last jump the owner took the kids up in another plane and flew alongside us while we were heading up for our jump. A lovely touch and end to the day ! Was the best experience of my entire life. The veiws were amazing and the guys were great. Definitely going back !! Eddie Jones as my instructor. I had to do it to make it an enjoyable and safe jump at all times. when you first jump out of the plane will stay with me forever!!! the minus 20 degrees that hit me when we jumped out at 10,000 feet!!! I absolutely loved my skydive and I enjoyed every minute of it, everyone was so friendly which made my experience that much better, everything was clearly explained which made me feel at ease and my instructor John was amazing. It was one of the best experience's of my life and I will never forget it. I will definitely be doing another jump with you at skydive Strathallan as I had such an amazing time. I would 100% recommend, 5 stars. I'd rate my skydive at Strathallan 5/5 as I had a wonderful time, loved every moment and would recommend it to everyone, young and old. Thank you all so much for a fantastic day. 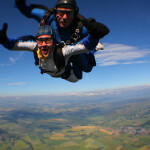 My charity tandem jump on Friday 10th August for Cancer research was Amazing!! A special thanks to Mr John Finnigan my instructor. I hope to see you again - I'm "hooked"
Hi i did a Tandem skydive on Saturday 4th August. I will give this a rating of 5. Absolutely brilliant experience, loved every second of it. I had Eddie as my instructor and could not reccomend him highly enough. Was feeling quite nervous beforehand, but he made me feel at ease and was humourous with it aswel. Overall a fantastic experience that i would definately like to do again. Thanks to everyone who made it an enjoyable experience. I had an amazing day thank you. It was my second time doing a tandem skydive and it was just as amazing and exciting as the first time. Lucky to have a nice day to take in the stunning scenery. Staff were welcoming and very friendly and good at making you feel at ease before doing something that’s quite scary!, definitely 5* rating! Wanted to do it all over again as soon as I was back on the ground. Thanks for an amazing day. Just wanted to pass on my thanks for making my daughters sky dive experience so amazing on Saturday her name is Sarah McGonagle. We received her video today and it is absolutely brilliant and a memory she will have forever for so many reasons. Absolutely wonderful and thanks so much again. My partner is desperate to do one now so I know what I’ll be getting him for Christmas. After signing up for my first skydive I was incredibly nervous and anxious but all of my fears and concerns disappeared after arriving at the skydive centre. There is a 45 minute training session which immediately puts you at ease and every single thing that will happen when you are up in the air is explained in great detail to ensure you completely understand how the jump will go. Everyone at the centre is so friendly and welcoming and each person fully understands the feelings you are experiencing on the day. From the moment I put my jumpsuit on till the moment I landed on the big X I was spoken to in such a calming way and everything was constantly explained and talked over with me. I have to say a massive thank you to Eddie for always ensuring I was okay and for making the experience so enjoyable! I will definitely return!! Thank you! Thoroughly enjoyable and exhilarating experience! Have never felt anything like it before and will be back to move on to static line jumps and hopefully progress to solo free falls! Complete adrenaline rush that I can't wait to experience again! Aside from the rush of jumping out of a plane, the views offered on the glide down across Perthshire are stunning. The team at strathallen are hugely professional, helpful and really add to the day - many thanks to all of you. And special thanks for the video of the experience, a great memento and very well captured and put together. It's an easy 5 stars out of 5! Many thanks and look forward to coming back for static line training, will look to book this in the new year. It was great! Definitely something everyone should try. Friendly helpful club members. Following the skydive with a review of like to say it was absolutely fantastic start to finish. Eddie was extremely professional and excellent at conveying the confidence and experience of the team, putting everyone at ease. Absolutely brilliant, will definately be jumping again. On the 15th September i done a Skydive with my boyfriend and his 2 daughters for my 30th Birthday. I could not fault Eddie and Billy, they acted proffesional and put us at ease from the start. What an experience and i cant wait to do it all again. Thanks guys!!! I completed my tandem skydive on Saturday the 6th of October at Strathallan. My friends had bought me it for my 30th birthday. I thought the whole day was amazing! I thought the staff were all so friendly and professional and made me feel really safe the whole time. I would definitely recommend strathallan to anyone thinking of doing a skydive. Definitely a 5/5 for me! Was lovely to have met such amazing people on Saturday July 14th 2018 at Strathallan airfield for our Scottish cot death charity sky dive in honour of our mum & brother . Was a great day and although we thought the jump may not have taken place due to weather conditions we waited 12 hours to jump and it was most definitely worth it . I didn't really need to speak to any staff during the day but when i did they were more than accomodating. The gentleman that took the training was very pleasent and helpful. Experience was great and would definately do it again. My only complaint is all divers for the day arrive at the same time and are randomly selected throughout the day to be the next jump. If each person was given a window of allocated time so that you can plan your day better then that would be a huge improvement. Everyone at Strathallan is very professional. They do an excelent job in explaining you and making you feel comfortable, especially when it's your first jump. Special mention to Eddie who was my instructor and camaraman Oscar who both made me want to keep progresing in this sport and start with the Static Line Course. Definitely 5 to 5. I will never forget this day. I absolutely loved my experience at Strathallan! Had to rebook as the weather wasn't suitable first time round which was disappointing but much better to be safe than sorry. So glad I decided to do the jump for my 30th, it was an amazing & unforgettable experience and I would definitely do it again. Everyone I came into contact with at the club was lovely and great at putting everyone at ease. I didn't feel nervous once. When I do another jump it will definitely be at Strathallan. Thank you to everyone at the club for giving me the opportunity to experience something so incredible! The skydive was an exhilarating experience, thoroughly recommend anyone to give it a try, you won’t regret it. I genuinely felt no fear at all, more excitement at what I was about to experience. Eddie talked me through exactly what I was to do and what would happen and this gave me complete reassurance. At the precise moment of jumping out of the plane, I did feel slightly disorientated for a couple of seconds but after this it was awesome/epic/brilliant/fabulous/surreal (all the usual banal words which are no doubt used by everyone), I couldn’t believe the free-fall element of the jump lasted for 35 seconds, it seemed to go by in about a third of that time! But what a rush! Once the parachute opened, it was a really calm feeling floating down towards the ground. Eddie offered to do a few turns to liven up the descent which was good fun, it was a good job however that I hadn’t anything to eat for about 8 hours at that point……..The landing was smooth, all the advice Eddie gave beforehand about getting the legs up on landing paid dividends. I would definitely do the jump again, would ideally like to pass the course to eventually be able to do solo jumps but I think the size of my frame would make it difficult for me to get down to the weight limit required for this and to be able to maintain that on an on-going basis. Anyway, I will definitely be back to do another tandem-jump. Thanks for the experience, five rating….. I had the pleasure of completing a tandem sky dive at Strathallan on the 25th aug, what an experience!!! Extremely friendly, experienced staff/volunteers. I was well looked after from start to finish. Views were spectacular. Would definitely recommend 5 out of 5. Eddie my instructor, absolute legend! My name is Ashley Strachan and I would rate my experience 5/5. This is based on the training being informative from what will happen on the ground and in the sky! All staff members were very friendly, welcoming and approachable. I was very much made at ease with the feeling of any question I had was a good one to ask! The day was well organised and I knew what was happening at all times. The only part I would say could be better is reception, when I entered the building I was only greated by other participants and told to wait there, I was a little unsure of this as I hadn't spoken to anyone from the centre. Maybe just a sign would suffice. I am very much considering coming back to do a solo jump following my experience of a tandum. I'm Calum Aird and I did my first ever jump with Skydive Strathallan on the 16th June 2018. Everyone at the airfield was extremely helpful and allowed me to thoroughly enjoy my jump. I would recommend Skydive Strathallan to anyone thinking of jumping and I will certainly be back soon. I would rate Skydive Strathallan 5 out of 5 and this is one of the best experiences of my life and I look forward to jumping again soon. Had a fantastic morning - Tandem Skydive for Accord Hospice in Paisley on this occasion. Thank you to everyone, but most of all to Mike my Tandem Instructor on the day. My name is Geoff Sim and would definitely rate Strathallan skivedive 5 out 5. Very friendly and inviting group throughout. My tandem jump was with Edd who was brilliant. He gave me clear instructions all the way through and Oscar took the video who was also great. I would thoroughly recommend this skydive centre. I jumped at strathallan on the 30th June 2017. What an amazing experience from start to finish. The professionalism of all the team at strathallan was exceptional, I was made to feel welcome, kept informed and the instruction was informative and fun, putting any nerves I might have had at bay. The flight getting up to altitude was great, the pilot pointed out areas of interest for us to see- e.g. Ben Nevis and Drummond castle gardens and then the jump-- wwwwwoooow. Absolutely fantastic, and as they explained it would be. After the chute went up we glided down to the ground at a lovely pace and made a safe landing. I would recommend this anyone, you are in safe hands and if you do all your told to do nothing should go wrong. A jump was not something I had craved to do but I am glad I got the opportunity and might even do it again. I would rate skydive strathallan 5 out of 5. Eddie, you and your team do amazing stuff here and just want to say thank you again, please pass on my thanks to Callum. Did a tandem skydive on 30th June. Had a brilliant time from start to finish. My instructor was friendly and funny and made me feel at ease. I was not nervous at all and enjoyed every minute. I would highly recommend to anyone, it’s an amazing experience not to be missed! Excellent experience, professional and welcoming...Eddie’s a legend!! Having spent 6 hours waiting in anticipation to jump, me and my daughter’s time finally came! We met our tandem instructors, we donned out super bright dive suits, padded helmets, and took some pre jump photos! As we made out way out to the waiting plane I could feel the adrenaline building and I really concentrated hard on staying calm and focused. The plane took 25 minutes to gain the required 10,000 feet jump height. On the way up Eddie, my tandem instructor pointed out various places of interest, the views were incredible! An uninterrupted vista all the way from Ben Nevis in the North West to the East Nook of Fife. Finally I hear the words…. 'edge your way toward the door and once there put your head back against my shoulder’. I knew this was now the point of no return, and I did as instructed. 'Okay, we'll go on the count of three’…..three….and we went! There was no two or one. My vision went from looking up at the doorway of the plane to suddenly looking down at the ground 10,000 feet below. The velocity of our drop increased rapidly and we began plummeting to earth! The next 30 seconds of free-fall were utterly thrilling, one of the most beautiful, pleasurable experiences of my life! At all times felt completely safe, even through we were travelling at 120mph with nothing between me and the hard rock below. It’s difficult to describe how wonderful the free fall is, just try it one day and you’ll see! When finally the parachute opened we rapidly slowed from 120mph to 10mph. The gushing noise of rushing air stopped and suddenly all was silent, and still. The next 3-4 minutes were spent slowly and calmly descending to the airfield. This allowed me to see my daughter on her descent and all was well in the world! When we finally landed I was so happy. I hugged my daughter when she landed, I hugged my instructor, I hugged her instructor. It was one of the most beautiful experiences and one my daughter Harper and I will have to share between us for the rest of our lives. Thank you Strathallan for making this happen, and for making me feel safe and well cared for throughout. The most amazing experience ever!! This was my first ever tandem skydive on the 7th July 2018, it was the most amazing experience ever!! I was so surprised that when I got up to 10,000 feet I wasn't as scared as I thought I would be. The instructor I had was brilliant he was so funny and put me at ease. He took the time out to speak to my friends and family and get pictures taken. This was a one time experience for me, a birthday treat from my husband so having someone there making it memorable and special really added to the experience. I had my jump recorded, the video guy was also very friendly and I received my DVD in under a week. The only thing I would change would be the music on the DVD, it just wasn't to my taste (I'm sure lots of other people like it). We arrived at the airfield at 830am and my jump wasn't till after 5pm. At the time you do not know the time of your jump and are asked to listen out for your name over the loud speaker. This made it a very long day for my friends and family as there isn't much at the airfield and they didn't want to leave in case they missed my jump. It would be better for them if an approximate time slot was given. There is a snack van at the airfield that has a good selection of food at reasonable prices and the lady who runs it is lovely. Inside the main building there is a small room with tables and a TV for jumpers to use. It would be great if there was a souvenir shop that sold keyrings, pens fridge magnets etc. Everyone is on a high after their jump and would snap up memorabilia to show off to their friends. It has been just over a week since my jump and it still makes me smile when I think about it, it truly was the best experience ever and everyone should do it at least once! Every person was friendly, helpful and made everyone feel safe and looked after at all points during the day. I was tandem jumping with Eddie and Callum who are both great guys, know their stuff inside out and added a good bit of fun into the jump. After 30 seconds of freefall and some cool spins and tricks on the way down I have to say it's a rush like no other. I'd happily recommend this to anyone! I done my skydive in the 2nd June and I can honestly say I was put at ease at all times. I was always kept in the loop what was happened and always reassured. I can’t thank everyone enough at strathallan for making my experience enjoyable not only for me but for my family. A friend booked a skydive for us both for my 40th birthday with Skydive Strathallan this weekend. What a great experience, best feeling ever. Great set up, friendly staff and so relaxed, these boys know their stuff and really put you at ease from the outset. Thanks to Eddie and Callum or tandem jumpers and George our cameraman. Definitely a 5/5 and would highly recommend Skydive Strathallan if your thinking of jumping- do it! Cheers guys keep up the good work Niall Ennis. I had a fantastic time and staff were excellent and made you feel welcome. Felt very safe doing my dive. Hoping to do it again very soon. I would rate as five. Thanks for this Eddie. We had an awesome day. I did my first tandem skydive today (27/05/2018) and it was the most amazing experience! All the staff were very friendly and made you feel so welcome and comfortable. Edddie my tandum instructor was awesome and a great laugh. Kept checking I was ok and totally made the experience! If you are thinking about doing a skydive, I would totally encourage you to do it and do it with these guys! You won't regret it! 5 out of 5! Thanks to everyone at Strathallan! I’d rate my sky dive 5. Eddie, my tandem instructor was great, and kept everything very light hearted. The whole thing was such a fun experience and can’t wait to do it again! I would like to thank you and all the staff at Strathallan. I attended on Saturday the 21st after my 1st attempt was thwarted by the weather, unfortunately in Scotland this happens and certainly nothing you or you’re team can do anything about. I checked in and then passed through to training, after this it was just waiting until my turn , which wasn’t long and spoke to a few instructors and some of the trainees who all made me feel at home and relaxed. Then I got called!!! . I was taken through to get ready and my suit and harness were given to me and suited and secured I was ready to go. I was taken onto the airfield to await the plane , I met two experienced members who would be jumping before me but travelling up in the same aircraft and the camera man. We got into the plane and away we went. I got secured to my tandem expert Eddie as we flew up to our height. I was super excited as we rose higher & higher and the time was upon us. The two experienced boys wished me luck and before I knew it were out the doorway and away. My turn we got into position on the edge of the doorway and Eddie took us out the plane. Wow , free falling at 120mph was absolutely amazing , I followed Eddies instructions and stretched out In free fall , it was a beautiful morning and I looked around as best I could as we fell OUTSTANDING, I guess about 20-30 seconds later Eddie opened the parachute and free fall ended. Eddie was fantastic pointing out landmarks and chatting , I was buzzing, he the asked if I wanted him to do a few tricks/manoeuvres which I certainly did , again fascinating and now it was landing time. I followed Eddie’s instructions and my training on the landing procedures. We were down safe and picked ourselves and the parachute up , then for the first time since we left the plane I seen the camera man who was filming me , I could not keep the biggest widest grin off my face. Into debrief and done WOW . As I write my review I’m still buzzing and have the biggest smile on my face . Thank you all very much. Eddie put me at ease and the jump was amazing couldnt have had a better experience. Tom was great with the video looking forward to seeing it. Here's my review from my jump on 21st April. I was supposed to jump on 22/04/18 but as the weather could potentially postpone the jump we decided last minute to jump on 21st. The team were very accommodating and make the whole process very easy. From completing the forms, to receiving the training, getting rigged up, to the actual jump! John provided the training and Eddie was my tandem partner. Both guys were brilliant. I felt extremely calm throughout the whole process and think that was down to the instructors. The free fall out the plane was the best part for me. Eddie was great and asked my permission before turning the parachute to make us dip slightly. Singing "Free falling" while falling so many thousand feet to the ground is also a memory that will last with me forever. I would highly recommend to everyone to give this a go, and would definitely rate these guys 5 of 5. Hi to everyone at strathallan. My skydive experience was fantastic. Everyone was friendly and extremely professional. I can't wait to do it all again. I recently jumped at Strathallan and I had the best experience ever. I was so nervous to jump however, all the club members were so friendly and comforting and made the experience the best it could be. I would rate my time spent at Strathallan a 5 and I can’t thank everyone there enough for how easy they made my dive. The whole day with skydivestrathallan was unbelievable. The trainers and instructors were very knowledgeable and extremely friendly and made a special day even more special. The jump itself was incredible, the views were amazing and Eddie made me feel extremely comfortable throughout the jump. My name is Liz Flatt myself and my friend Ruth Lamont recently did a jump with Skydive Strathallan, it was a great experience and the freefall was amazing, even though I screamed like a banshee, I loved it. I cannot thank Eddie enough, he made me feel very relaxed and safe. Even the trip up on the plane was a great experience in itself. The food at the van is delicious, my dog Harry loved his square sausage too and all the attention he received. Thanks to all at Skydive Strathallan. Lovely relaxed atmosphere and clear training instructions pre jump ,friendly lady in the office kept us updated with weather information during the day. This was our third trip to Strathallan due to weather but worth the wait. Many thanks to Rosies instructor (sorry I forgot his name) for his enthusiastic, friendly manner . Lastly,extra special thanks to Eddie ,top marks for his kindness and companionship.I hope I havent put you off carrots for life. First of all I'd like thank you for the wonderful experience we had earlier on this week. Truly a memorable day for me. With this, my 2nd time going through the initial breifing i cant help but think there was something missing - almost made to feel not welcome (just another guy paying for a tandom - not a real sky-diver) I'm aware they/you are simply volunteers giving up your time but when my wife payed a handsome fee tor the experience itself there was never anyone to greet us upon arrival and when the instructions strictly state 08:45 with almost no room for excuses. That being said really was a couple of minor points to maybe help with future appointments. You were awesome and made me feel at ease throughout so none of the negative points being made were a reflection on you. I would.consider myself to be quite good with the English language and yet I am at a loss because words are weak in my attempts at describing how i felt jumping out of a plane and I can't thank you guys enough for giving me the most memorable experience of my life to date. Thanks again Eddie - can't wait to see the DVD and any time you happen to be down my way feel free to pop in to Tiso and I'll sort you out with a good pair of gloves. My experience at Sky Dive Strathallan was absolutely brilliant from start to finish. I was a nervous wreck but everyone there made me feel at ease throughout the whole day, the banter was superb. The jump itself was one of the best things I have ever done and will definitely be doing another one at Strathallan in the near future. Definitely a five star experience on all accounts for me. I was bought the tandem skydive experience for my 30th birthday. It was absolutely amazing one of the best most thrilling experiences of my life, totally loved it! From the wee flight up the jump itself and landing all where brilliant. And all the people involved where so friendly and really experienced so put me at ease. Would defiantly recommend to everyone looking for a once in life time experience! Brilliant! Thanks Strathallan! Overall, I thought the experience was excellent, and it was a pleasure to jump with Eddie. The instruction was good and clear and I always had confidence that I was in safe hands. If I had any criticism and it is only minor, it would be that I felt there was a bit of confusion in the morning as to where we were to go when we reached the centre, etc. However, I understand people are generally giving up their own time to run the club. Thank you to everyone at the club for a very memorable experience! I have done our review. I want to personally thank you for my experience I was very worried about it especially landing ext. not as fit as I used to be since breaking my leg. You made me feel like I could do it so I thank you for that, and made a day very enjoyable. Iv sent a video and pics if drew and calum and some of us if you could maybe pass on to calum for drew. Thanks again and obviously it’s 5/5 from me. Just wanted to say a massive thank you to all the volunteers at strathallan for helping me to experience sky-diving! I will not hesitate in booking up again..hopefully I get some gift vouchers for birthdays/Christmas! Without a doubt, strathallan gets a 5 out of 5 from me! My experience here was great, service from volunteers was outstanding helping along the way making sure I was always comfortable, Eddie the instructor ensured I was always at ease and we got on well. I would definitely go through this experience again, and will be booking again very soon as the experience was overwhelming. I would personally rate this experience 5 stars, thanks Thomas Brown. I do not know were to begin. Saturday for me was a dream come true and more. I was totally apprehensive upon arrival that there could be a possibility of another reschedule due to weather conditions but luckily for me it was 2nd time lucky. The Instructors made you feel very welcome in the seating area and their banter was on point. From the minute I stepped into my safety gear to the minute my feet touched the ground after the jump Eddie and Charlie made me feel so relaxed and excited. Not once was I nervous. I can honestly say I felt so safe. There are no words to experience how this feels. My advice to anyone would b experience it for yourself! You literally feel on top of the world. My rating for Skydive Strathallan and the team there is a 5. Thank you for a memory that will last forever and I really do hope to do this again. I loved every minute of it. From getting kitted out, to jumping into the Cessna and flying up to 10000meter height. It was amazing to fall out of the plane and do a rolley polley. Callum was an absolut star and i felt really safe with him. At no point i was worried. I just had an amazing time and enjoyed the whole experience. The experience in Sunday was amazing. Me being a Nancy and scared of heights was totally taken away from it all . The team you have at strathallan were great and the tandem team were fantastic. I had a great experience with strathallan sky dive, definitely a 5 out of 5 from me! I was terrified to begin with but they really made me feel at ease and comfortable I was in safe hands. You can't garuntee on the weather so it does take time and patience but worth it. Loved the experience, once in a lifetime and looking forward to doing it again sometime! Myself & my sister did our Tandem Skydives, Sunday 26th November 2017. This experience was just amazing. The staff are great, friendly & explain everything. I loved every part of this day. The freefall is awesome but is just one part. I thought I'd be so nervous, infact from getting ready till I landed, every part I enjoyed & I was very surprised how calm & at ease I was at 10,000ft about to see some clouds close up. The scenery during the flight is simply breathtaking. 5 stars is so deserved for Strathallan. I'd recommend this experience to anybody, I landed with a big smile. Thank you Eddie, & to the cameraman & pilot. That Evening was Awesome, few hours of wait, has been worth it, i Think i have met my new passion, Every thing was prepared proffesioinally Including checks by other instructor/Skydiver on YourSelf, at this moment, i knew That im gonna just enjoy all of that and i was not wrong 100% Trust for Your skills. Amazing experience in a fantastic location. The training and guidance was 1st class. I can also highly recommend a bacon roll from the van to start your day! Many thanks for all the efforts put in by the team at Skydive Strathallan. My sister and I both had tandem skydives on Saturday 7th October! An utterly amazing experience. Although the weather didn't play ball in the morning we persevered and finally got the nod as the sun was setting. It was perfect! A huge thank you to the stupendous Mike and excellent Eddie for looking after us, Oscar for sticking around to be my cameraman and our incredible pilot. I absolutely loved every second and would do it again in a heartbeat! I did a tandem skydive at Strathallan on the 12th August 2017 and the experience was sensational. The feeling I got during freefall was like no other. The adrenaline was flowing through my veins and it felt fantastic. I enjoyed it so much, I have booked another skydive at Strathallan and I can hardly wait for the date to come through. I would rate the whole experience as 5 out of 5, the staff are friendly and knowledgeable and I had a great time. Absolutely loved the experience. Was something I always thought about doing, but thought id never get round to actually committing to. Was an experience that will live with me forever and can't thank the team enough. All the members that we spoke to on the day were great and obviously love what they do. Cant wait to go back and try out a static jump! Huge thanks to John and Eddie for a fabulous experience. 5 stars to you both and all the staff encountered during our visit, couldn't have been any better; you made Jack and my first experience of a skydive the best. Loved every moment, can't wait to come back and do it all over again. I completed my skydive today and wow what an experience! That feeling hanging out of a plane at 10,000 feet was scare but what an experience. You guys do a great job, keep it up! Dear Eddie, thank you so much to everyone at Strathallan Skydive for the most exciting experience of my life. It was so exhilarating and completely surreal. Mike couldn't have been nicer and was so reassuring whilst making the whole thing brilliant fun. You are a great team and I would love to come back and do it all again some day. My jump today was an absolutely amazing experience would do it again over and over 10 out of 10 for the experience of a life time. 10 out of 10 for the staff especially Eddie Jones my instructor that jumped with me worth the money worth the experience. Really enjoyed it and the adrenaline was something else. Many thanks and shout out to al the staff. My name is Tracy Austin and i had a tandem jump today 2.9.17 with Mike. Mike made me feel so relaxed from start to finish and made my experience so much more enjoyable. I got to take control of the parachute and Mike done some twists in the sky which was amazing. If anyone is ever thinking of doing a tandem jump i would definetely advise it as the whole experience was awesome. I cant thank you all enough for letting this happen. I was raising funds for Monklands Hospital Ward 10 in memory of my dad and so far managed to raise £2500. I am Master student in Sheffield. I selected Strathallan based on many factors including, it is the first time for me visiting Scotland, I was looking to meet Scottish people they have a good reputation and all my friends whom had visited Scotland told me how they are friendly and helpful. My final word to Strathallan Skydive team I appreciate everything you did , and for sure I am going to visit you again and again . - One of the best experiences of my life and the instructors made me feel calm and at ease! Can’t wait to go back again. On both occasions at Strathallan the nerves where well and truly on point. All the instructors where very professional but managed to keep me from running back to the car!! From the first moment of jumping out the aircraft…..words can’t do it justice. 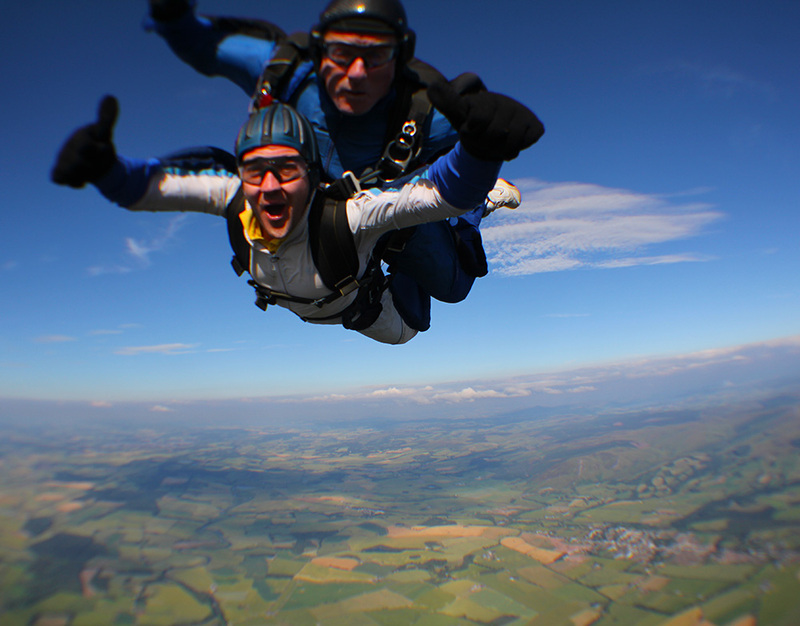 My instructor Mike was fantastic, highly recommend to anyone wanting to jump for charity.
. Excellent experience and all the staff were very friendly and professional. I felt very safe in their hands. Highly recommend for first timers like me. A huge thanks to all at Skydive Strathallan we had a great day can't wait to come back and do it all over again! Had a fantastic day, the skydive was incredible! Very well run from start to finish, and my Tandem Instructor Michael was top class! I did my first sky dive 5 days ago and it was an incredible experience!!! Honestly the best thing I have ever done, loved every minute! My instructor was called Callum, my brothers was Mike and they were both so lovely and put my nerves at ease instantly. 5/5 - would highly recommend sky diving here, it's worth every penny and I can't wait to return and do it all over again! Absolutely loved every minute of it would definitely do it with yous again. Fantastic service from everyone at Strathallan Skydive felt at ease n keep upto date with everything at all times. Well done to you all yous do a fantastic job. I received my video and its brilliant! Thanks for an ever lasting memory. Here is a wee review for the tandem skydive I did last week. "Had the most amazing experience at Skydive Strathallan doing my first tandem skydive. The staff were great and very welcoming. The footage from my film is also fantastic and is a great memento to look back on. Would definitely recommend Skydive Strathallan to anyone considering taking the jump! Can't wait to do it again some day :)"
I had an awesome time on the 17th of June at Strathallen doing my skydive. I would give it 5 out of 5 as found the experience to be exhilarating and amazing. I wanted to do something different for my big birthday. This ticked the box. Having done a helicopter ride and para sailing, I wanted to try have a go at something different and this definitely ticked the box. I would recommend doing a tandem jump to anyone & everyone who's thought of it providing they are well. I felt safe & secure throughout the whole day thanks to your training & calm & steady approach. I did my first ever skydive on Saturday to raise money for the SSPCA. Eddie took us all through for the training talk and he was really good at explaining everything. I was nervous but after Eddie’s talk I was raring to go. Unfortunately the one thing you can’t control is the weather so there was a good few hours of hanging around. My advice is go on your own, then you don’t have to put up with constant questioning from friends and family asking when are you jumping and suddenly being experts in the weather. I heard a lot of that and I think it would have stressed me out more! I had a fantastic experience today with the Tandem Sky Dive, this was only my second attempt with the first just being 29th May when we had low cloud cover so I think I was quite lucky. Everyone that I have dealt with at the club have been great, I am fully aware that you all give up your time as volunteers and this is appreciated. After today I can see why people get addicted to the sport and I may well look to do more myself in the future . Many thanks to yourself for taking care of me today, you gave me great guidance and instruction and I am sure that because of your approach, I was not nervous at all, which may be be a little strange, but just meant that I could enjoy the full experience even more. For me you guys deserve a 5 out of 5 and the rest. On Saturday 6th May my best friend and I came up to Strathallan from Livingston go do our very first skydive - it won't be the last! The experience was amaaaaazing!! Nothing like we have ever experienced before (and we've done some crazy things!) From start to finish the staff were extremely professional, funny, and put our nerves at ease as much as they could! I done my tandem jump with Mike who was very funny and chatty and I felt very safe with him. Sorry for the crazy nervous giggles Mike! And Thankyou sooo much again! My cameraman who shot my go pro video was lovley too and I totally cried when I received my dvd in the post. You done an amazing job Thankyou so much! I would highly highly recommend Strathallan if an amazing skydive is what your after. Unbelevable experience, Thanks to all at Strathallan for an experiance I will never forget, You have to do this ! Mike and Eddie were great! Being a cancer survivor makes you realise you have to live life to the full. At 49 and two weeks from my 50th I had one chance to do this. Fortunately the weather was kind to us. The whole experience was just amazing and everybody looks after you really well. I would highly recommend the company and the experience. Getting to tick this off my bucket list and raise money for Cancer Support Scotland (the charity that helped me rebuild my life) is win/win . My jump was for yorkhill children hospital it was 4th time lucky for me at the airfield but what can we expect from Scottish weather,...... As for the jump it was well worth the wait, I had a great instructor .... Michael lee who made the experience a great one very down to earth and easy going. Think I will consider the static line course now. Thank you to all the volunteers involved. I've never felt so alive!! What an amazing experience. I will definitely have to do it again. Staff were great and very friendly and I have to say a big thank you to all involved. Only disappointment was rescheduling due to bad weather, but that just made the experience even more exciting once I was in the plane and it was up in the air. Had a great day everyone connected to strathallan were brill would do it again. Thanks for the voucher Ali - finally did it!